Last month we went to a talk by climate scientist Dr. Kevin Wood – he’s a part of the “old weather” team at the NOAA-University of Washington Joint Institute for the Study of the Atmosphere and the Ocean (JISAO – rhymes with cow), and saw this really cool visual which displays total volunteer effort (in this case, logbook pages digitized) in one rectangle. Each box within the rectangle is a participant and the size (or area) of the box is scaled to the percent of total effort. Colors allow the viewer to distinguish one box from another. Colors indicate when each person joined (year 1, year 2 or year 3). The size of each box is scaled to the total amount of time each person has surveyed. At the top left is someone who joined in Year 1 and contributed LOTS of time, about 20% of all survey effort shown (over all 21 squares). Toward the bottom right are participants with less time invested in surveying, including one we point out who joined in Year 2 and has contributed about 1% of the total survey effort. 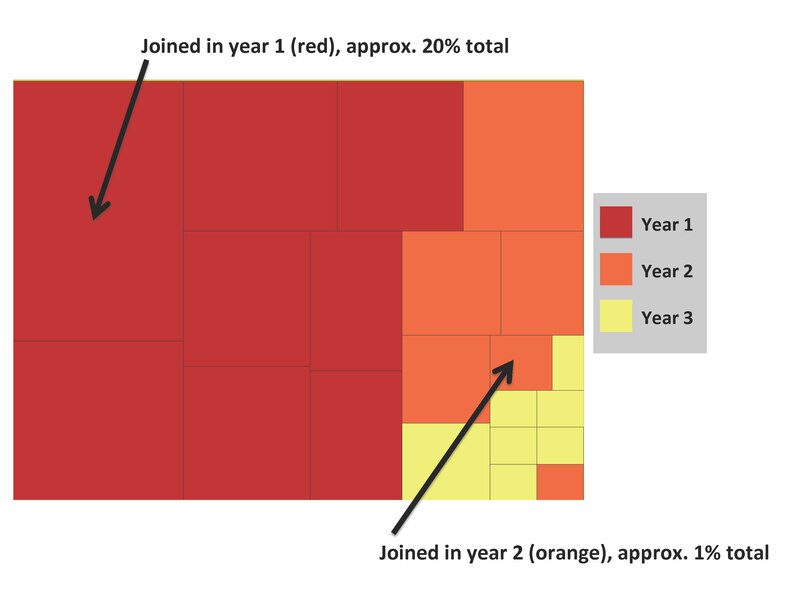 Standing back, it’s easy to see a color gradient which reflects that participants who began in Year 1 (red) tend to have contributed more – on average – than those who only just started in Year 3 (yellow). Green and blue years are earliest, so it is not surprising that these “old folks” dominate the upper left. 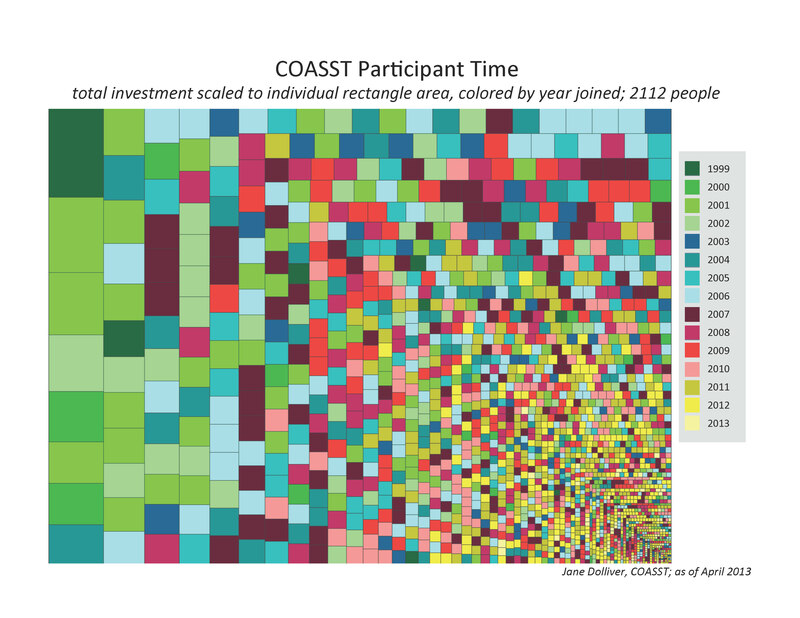 The very largest box represents about 1.8% of the total time, and you can see that there are plenty of folks who joined in the late 2000s and have already racked up the hours! Harmful algal blooms, puffin die-offs, grebe mortality – there is always something pulling COASSTers out to do extra surveys. Small boxes don’t mean slackers! Lots of incoming COASSTers (yellow) are toward the bottom right – our program continues to grow. Many of the small boxes are inside waters COASSTers – with short beaches and nary a bird in sight, it’s just not possible to amass the hours of the “birdy beach” volunteers. In fact, each COASSTer contributes their piece to the COASST whole – all of us together make COASST successful and sustainable, and now, colorful! This entry was posted in Uncategorized and tagged Citizen Science, Volunteer on May 17, 2013 by coasst.